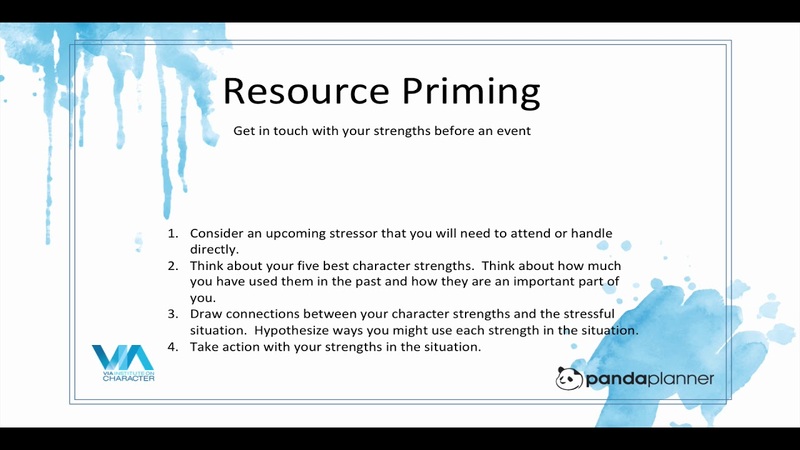 Get in touch with your strengths before an event! Activate your internal resources and prepare yourself for success using this strength-priming exercise. Before a stressful event, a challenging task, or even a conversation with a friend, try this exercise to get in touch with your strengths. Consider an upcoming stressor that you will need to attend or handle directly. Think about your five best character strengths. Think about how much you have used them in the past and how they are an important part of you. Draw connections between your character strengths and the stressful situation. Hypothesize ways you might use each strength in the situation. Take action with your strengths in the situation.